If the 6A80 mistake now appears in Canon printers, you'll know how to fix it by following these steps. 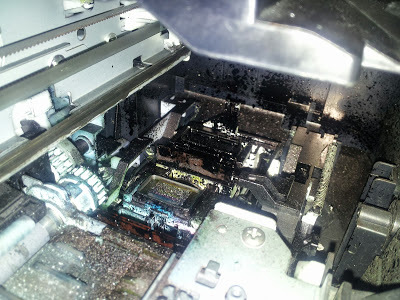 This is a general error in Canon printers, occurs when the print head is covered then a procedure that will help us solve the problem and then reset code to restore your computer. So that this error does not appear again after deleting it is always recommended lubricate constantly had through which passes the printhead. We recommend using gloves, our hands are inside the printer, as you know spilling ink cartridges in and may dirty our hands. Turn off the printer and disconnect the power cord electricity, you can not forget to disconnect the printer. With hands grabbed the cartridge carriage and move it from left to right, at least three times, this should reach each end, and carefully smooth. We try to move the brush to clean the cartridge nozzles, are on the right side of the printer where ink cartridges rest, moves carefully trying to remove any jam that they have. Check carefully if you have above a paper jam, remove any residue or piece of paper that might obstruct the operation. If after doing all the above procedure and the printer still continue with the same problem, we must try to restore it. The above steps can say it was for maintenance, we must now tell the printer that all is well. Release the button on and off first. When the printer is powered release all other buttons simultaneously.